IBPS is probably the biggest name the Indian hiring space to use online tests for banking selections. Initially, IBPS also used offline written examinations for their recruitments. However, in 2013 IBPS introduce their online examination platform for Clerk Recruitment. Slowly they expand it to PO, Specialist Officer, and RRB recruitments. Appearing for the IBPS exam the first time? Here is the procedure for taking the online test. IBPS Exam online test: a video demo. When you reach the examination center, you meet IBPS executives inside or near to the Institution’s premises. They verify your call letter, ID proof, etc. and send you to the computer lab. You have to sign your IBPS exam call letter in front of the invigilator, who later assigns you a PC for the IBPS online test. 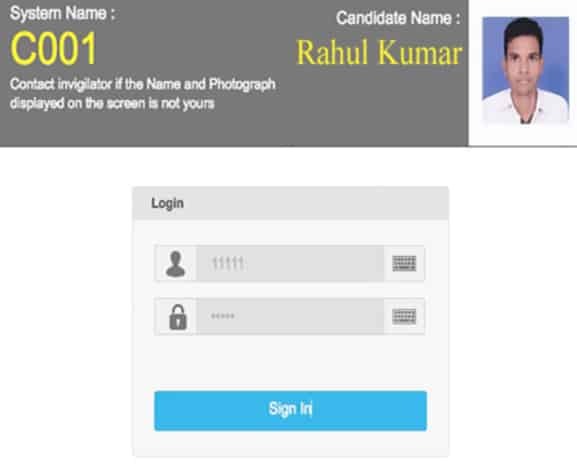 As soon as you see the IBPS test window, verify the name and photo given the web application. Also, make sure that your PC is in perfect operating condition. Sign into the IBPS online exam platform with the roll no and password provided in your admit card. Click Next to read the instructions for taking the IBPS exam. Read everything carefully and proceed. In the next page, you may choose the medium for the online test. English is the primary language for IBPS examination, but Hindi is also available for some tests. Accept the IBPS guideline by ticking the checkbox and press “I’m ready to begin” button. Sometimes, you get a trial test which you may attempt before the original exam starts. It is also possible to view the result [score] for this test. When the time starts, the IBPS online exam page automatically loads to your desktop. One thing you should be prudent while on IBPS online exam is not to touch the keyboard, after logging in to the portal. Invigilator usually communicates this clause before you start the test. Watch the video demo of the IBPS exam online test engine for more insights. Although slight changes are there, IBPS uses a similar web app for all their recruitments and online tests. 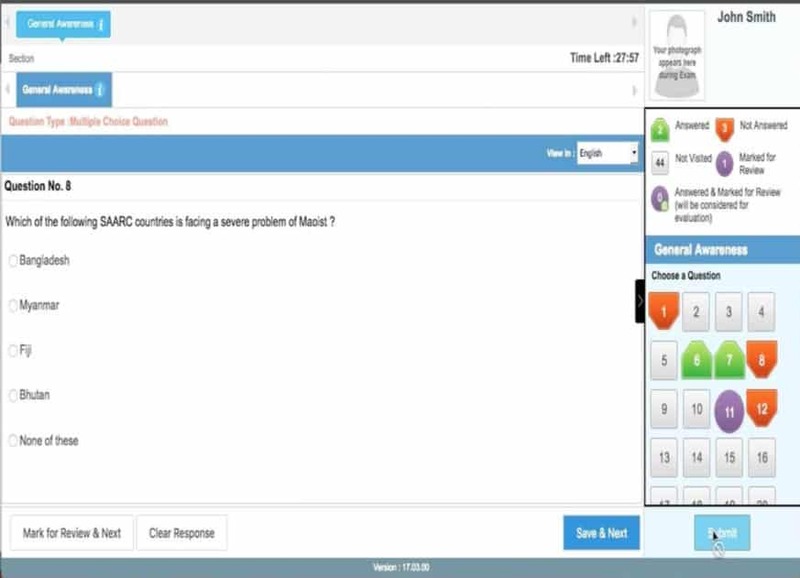 The online examination part in the demo video is the same thing you would see in the IBPS center. As of 2018, IBPS online exam follows a multiple-choice model. A correct answer adds one mark to the candidate’s score, and a wrong answer deducts .25 mark. IBPS may provide papers and pen for your rough work and calculation, as per their rules for each exam. On the right-side of the IBPS exam’s online page, you there is a quick-access menu to the questions. It is possible to browse through all questions by clicking on those numbers, which by default, has a White background color. You can answer a question in the default order or by selecting a number from the listing. Press “save & submit” button to add your answer. Already answered question numbers appear in Light-Green color. Moreover, the background color turns Orange when you open a question and do not select an answer. There is also an option to mark questions for reviewing or answering it in the end. Use the option “Mark for Review & Next” to include a question to your review list. You may open them later by clicking on the numbers with the Purple background, in the question menu. The top section displays the time remaining for your to complete the IBPS online examination. In this demo, there is only one category “General Awareness.” However, in IBPS Bank exam, you get the option to switch between subjects. Finally, when you complete, press the submit button to finish the exam. Please note that the submit button activates after the time ends. You have to present in the lab until the last second, even if you complete the test before the allotted time.